Dr. Mario Online Rx, known as Dr. Mario & Germ Buster in Europe and Australia and as Dr. Mario & Saikin Bokumetsu (Dr.Mario＆細菌撲滅, lit. "Dr. Mario & Bacteria Extermination") in Japan, is the first WiiWare video game of the puzzle genre to be released for the Wii by Nintendo and the fourth installment in the Dr. Mario series. The title features both traditional Dr. Mario gameplay in addition to Virus Buster, a mini-game from Brain Age 2: More Training in Minutes a Day! and Brain Age: Concentration Training. Germ Buster has been modified for motion-sensing control rather than stylus control. The title costs 1,000 Wii Points to download in all regions. The Wii Shop Channel closed at the end of January 2019, therefore the title is no longer available to purchase. In both modes, the traditional goal of the Dr. Mario series carried over into this title. Players maneuver Megavitamins tossed into a glass jar in order to destroy the Viruses. In order for a virus to be destroyed, it must be connected to at least four Megavitamins of the same color. In this version, either Dr. Mario or the player's Miis can toss viruses into the glass jar. Virus buster can only be played with the . In addition to the single player mode, Dr. Mario features local and online multiplayer. The title took advantage of Nintendo Wi-Fi Connection for online matches between friends around the world. Players could download the multiplayer demo from a friend who owns the game, enabling players to compete when only one owns the title. Despite region encoding of the Wii, the multiplayer demo may be sent to a Wii system of a different region. The doctor is in! Mario takes a break from his adventuring ways and once again dons his stethoscope for a new generation of germ-battling mayhem. In addition to the classic mode of using vitamins to exterminate viruses, you'll find two battle modes and an online multiplayer mode where you can hone your skills against players from around the world. Feel like challenging a friend who doesn't have Dr. Mario Online Rx? Then the WiiWare-exclusive Friend Battle Demo is just what the doctor ordered. Or maybe you'd like some help taking on those nasty Viruses? Try out Virus Buster, where four players can simultaneously move capsules simply by pointing at them with a Wii Remote controller. 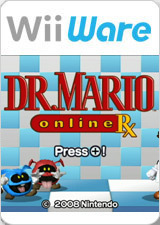 Any way you look at it, Dr. Mario Online Rx is a prescription for fun that everyone can enjoy! Basic gameplay with Dr. Mario. Basic gameplay with a Mii. Winning against a computer opponent. Wii Sammy Barker, Nintendo Life 7/10 "Dr. Mario looks great, sounds great and plays great, just like the original did 18 years ago, and the inclusion of online multiplayer adds value. Newcomers to the series will be thrilled, but puzzle veterans may be a little disappointed. Dr. Mario was and still is a very, very good puzzle game and that fact remains unchanged here. If you’re a fan of Tetris or puzzle games in general then you will be delighted with this game. If you already own a copy of Dr. Mario on NES, Game Boy, SNES or N64 then think twice before picking this up unless online multiplayer really floats your boat." Wii Dan Whitehead, Eurogamer 7/10 "It's certainly a decent enough block-dropping puzzler, even if most people probably would've preferred Tetris. Or a Virtual Console release for the SNES Dr Mario and Tetris compilation. Either way, 1000 Points feels a bit steep." Virus Buster in its original form was designed to help players relax instead of training their brains in Brain Age 2. It even includes relaxing arrangements of the classic Dr. Mario music. In the Virus Buster game, if the player presses while their cursor is on a Mii while in game, it will say something such as, "Good luck, Dr. Mario!" or "The more bitter the medicine, the better!" Sometimes, the Miis will tell the player information concerning the actual gameplay, such as how many minutes have passed and how many capsules they've thrown. If the player presses while their cursor is on a Virus, it smiles to the front. This page was last edited on April 5, 2019, at 11:13.